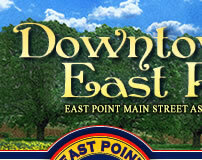 Each month, the East Point Historical Society provides an article for the "Flashback Feature" for the Downtown Newsletter. Each article highlights a piece of East Point's vibrant history. More information about East Point's history is available at the East Point Historical Society located at 1685 Norman Berry Drive, East Point, GA 30344. You can contact them at (404) 767-4656 or visit www.eastpoinths.org. All "Flashback Features" will be archived on the website and can be accessed at any time. 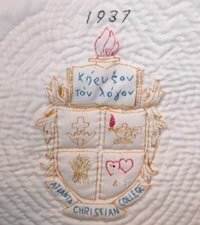 In 1987, members of the East Point Woman’s Club stitched together a quilt to commemo-rate East Point’s Centennial. Each of the 49 squares helps tell the story of East Point’s history. The quilt is on display at the East Point Historical Society. 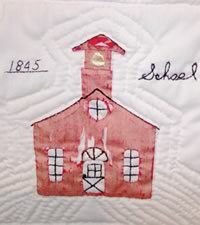 Here are the fourth and fifth parts in a series of East Point history lessons, as reflected in a sampling of the quilt’s squares. Providing educational facilities and learning opportunities has been a part of East Point history since its very beginnings. Schoolhouse: In 1845 at the Connally Plantation, a private school was established and operated there until 1867. In 1891, public schools were created and in 1895 Central School was built, on the site of the current City Hall. African American children were most often educated in churches. In 1915, three new elementary schools were authorized; Harris St. and Church St. for white children and Randall St. for African American children. 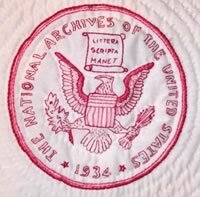 National Archives: The National Archives was established in 1934 to centralize federal government record keeping. The building that housed the Southeast records center was built in 1955 in East Point’s Colonial Hills neighborhood. Atlanta Christian Collage: Founded by Judge Thomas Hathcock and his wife Nora Head Hathcock in 1937, the college is located on farmland donated by Mrs. Hathcock. In 2011, the name was changed to Point University and the main campus moved to West Point, GA.
Public Library: Completing the block of city buildings in downtown East Point, the East Point Public Library was dedicated in 1939 and served East Point residents until the mid-1990s when it merged with the Atlanta Fulton County system. 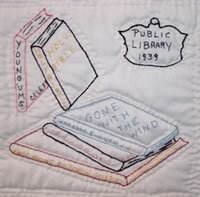 William H. Howell was the first librarian and remained in that position until his retirement in 1974.